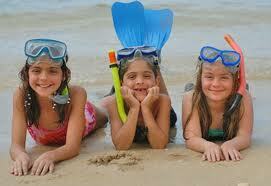 Want to make your family deliriously happy, plan a family vacation in Jamaica. From the moment you mention Jamaica your family will start imaging laying out on white sandy beaches, reggae music, jerk chicken, snorkeling in turquoise warm sea to just dive in and look at colorful fishes. And best of all no schedule to follow just waking up when your body says it is time.. complete flexibility is yours. A tropical vacation in Jamaica is where fantasy and reality meet, you just have to plan it right by choosing the best hotel, resort, cottage, or villa that meets your heart desires, whether all-inclusive or having your very own chef and butler. It is all possible in Jamaica... Ya Mon. There is nothing like the warm white powdery sandy beaches of Jamaica to keeping all members of a family happy on a vacation. Your children can run, scream, splash about in the water, jump on slides sliding down into a pool without anyone trying to keep them quiet or control them. Your very small ones can attend the many activities specifically put together just for them. By donning your snorkel masks and fins you and your family can visit the many coral reefs that are located very close along the shores of Jamaica to see the many underwater sea life. Or you can go jet-skiing, sailing, swimming and windsurfing. Remember to purchase and carry your own snorkeling gears it will cost you less to go snorkeling and you and your family will have better fitting equipments. Inflatable rafts and floats are easy to pack. And remember yourself... at the end of the day do you want to enjoy some entertainment while your little ones are asleep. Start planning your Jamaica vacation early by thinking of each family member's likes, dislikes, ages and taste that will help to guide you. Will they be happiest with non-stop action. Will a budget hotel be best where you have access to the beach where you'll create your own fun in the sun. Only occasional use of the television, VCR and video games. Kids must enjoy themselves by being very active to prevent boredom. While you the parents can fill your days with scuba diving, play some golf, tennis, participate in resort's planned activities. Or just sit and soak up the sun in peace and quiet or catch up on your reading. Remember this is where you start creating lifetime memories, so search for off-peak time, looking for offers that gives you a lot in return. April through to mid December is regarded as off-season. To be able to stay at some very nice resort, choose garden view instead of ocean view and forget ocean front. Though if you have very small children and need to carry a lot of stuff to the sand, you may want to choose a room close to the water. All-inclusive are a great bargain, though all-inclusive can mean different things at different resorts. For instance some resorts offer complimentary non-motorized water-sports but charge for excursion, while at another resort you have to pay for non-motorized water sports. So take the time to add up what you get and most often you'll find that an all-inclusive vacation is great for families. Shorts, T-shirts, sundresses, swimsuits and depending on the type of resort each member of the family should take a dress-up outfit. Remember to pack hats, water shoes, first-aid kit, sunblock and plastic bags - for your wet clothes. And, remember to carry snacks for your children in your carry-on luggage just in case there are delays. <>, I love a good warming soup, a little thick and filling. This spicy Jamaican flavorful soup is a great way to warm you up. With cayenne pepper to help flush out toxins and lots of vegetables providing you with the needed minerals for your body. 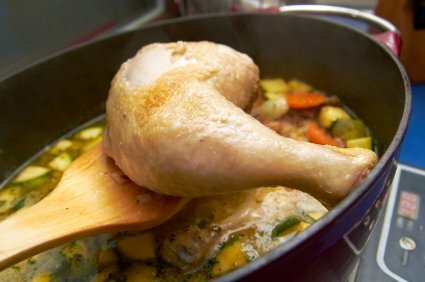 Heat olive oil in a large saute pan over medium heat and add seasoned chicken thighs and cook for approximately 5 minutes on each side. Remove chick onto a work surface and chop it into 1-inch pieces and set aside. Turn off flame and stir in cilantro and add cooked chicken. Let sit for 5 minutes than divide soup among 4 bowls and top each bowl with 1/4 up tortilla chip. Delicious. Makes 4 servings: Per serving - 389 calories, 48g carbohydrate, 55mg cholesterol, 12g fat, 21g protein, 431mg sodium, 6g fiber. As you can see there is simply no better family vacation than one with sun, sea, sand and year round beach weather. At the end of your family vacation in Jamaica your spirit will be completely renewed. Again thank you for subscribing to this month's newsletter, and remember to visit our website for more useful information on the beautiful island of Jamaica.